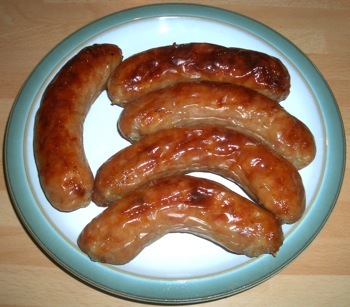 There are few sausage makers who I would have taken seriously when they told me they had made a pork and Christmas pudding sausage. Charles Clewlow of H Clewlows of Natwich is one of those few sausage makers. Charles is a sausage maker of distinction and knows what makes a good sausage. He recently won the regional heat of the British Sausage Week competition with his pork and Nantwich blue sausages (more on those in a minute) . However, as someone who doesn’t often mix sweet and savoury, I was still concerned as to how Christmas pudding would work in a sausage. Putting Christmas pudding into a sausage turned out to be a stroke of genius. These succulent sausages were sweet and caramelised. They were bursting with flavour and, although it wasn’t overwhelming, you could really taste the Christmas pudding. I was surprised, I suppose, just how well this worked. The depth of flavour would make it a hit for dinner in the midst of winter when something a bit special is needed. 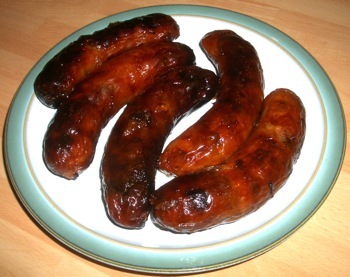 I knew I was in for a treat with the competition winning Pork and Nantwich blue cheese sausages. Charles had impressed Paul Daniels and Debbie McGee during British Sausage Week but I was biting at the bit to see what I thought for myself. This is definitely a sausage for the strong cheese lover. But it is also mellow enough for people, like me, who don’t normally eat blue cheese. The pork paired perfectly with the blue cheese to create an absolutely sensational sausage. The blue cheese provided a creamy dimension to this moorish porkie banger which I was hooked on from the first taste. Stepping inside Charles’ shop in Nantwich is like stepping into an Aladdin’s cave of all that is good about a butcher’s shop. 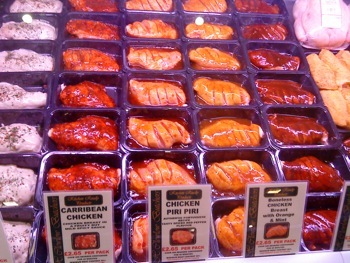 From award winning sausages with locally sourced ingredients to pre-marinated chicken breasts, there is something for everyone. 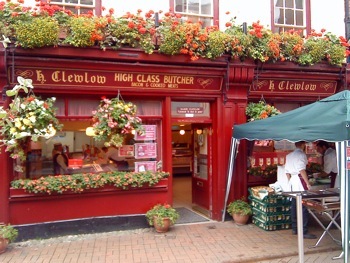 If you are ever near the pleasant market town of Nantwich, H Clewlows alone is worth the detour to visit!